The Phytophactor: What was Prototaxites? Prototaxites has been a classic enigmatic fossil, which means no one knew what it was other than it appeared to be really big when nothing else really was. 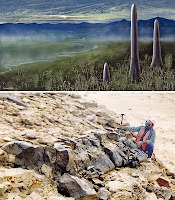 Prototaxites appeared to be some type of cylindrical axis , which when stood upright would have looked like telephone poles on a landscape of plants standing little taller than your living room carpet. That’s because Prototaxites existed during the Late Silurian and Devonian, a period of time when vascular plants were just getting their rhizomes under themselves. Prototaxites fossils display a strange spiral inner organization and a filamentous composition. Not too long ago, the filamentous organization of Prototaxites led to its identification as a fungus, the “humongous fungus” and this is the actual cover of the journal this research was published in. But a team of my ever creative colleagues lead by Dr. Graham (no, not the one of cracker fame) have just published their reinterpretation of these fossils by actually recreating plant remains that have the same appearance as Prototaxites. Dr. Graham is well known for torturing liverworts to see if any of the degraded remains bear similarities to enigmatic fossils of early land plants. The evidence they present suggests Prototaxites formed a helical cylinder when a large mat of liverworts was rolled up probably by the winds that would have howled across a treeless landscape. This further reinforces the hypothesis that plants with a bryophyte level of organization (mosses and liverworts) were pioneers on land long before vascular plants appeared. The Phactor hopes that PATL (People Against the Torture of Liverworts) doesn’t begin picketing her lab.